As we’ve learned in the last year or so, the man whose catchphrase is a straightforward “You’re fired!” has a bizarre and tortuous method of dismissing his top employees in real life. 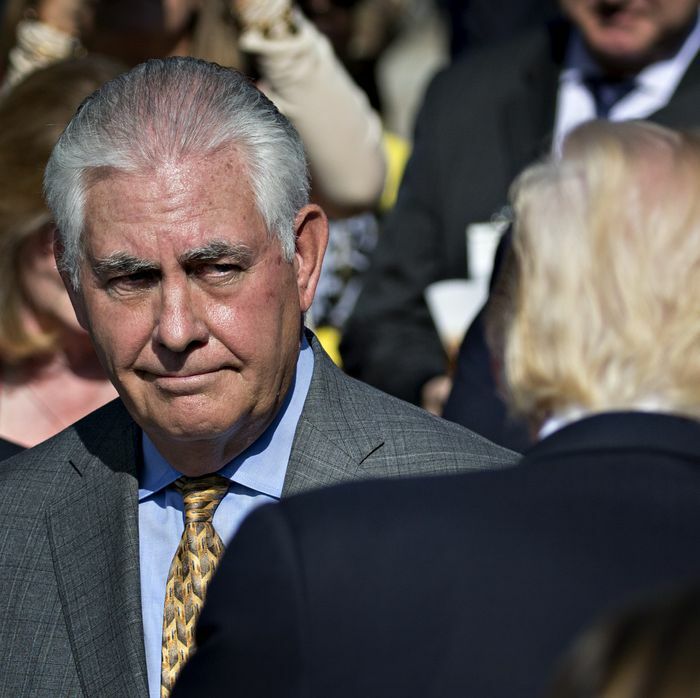 While rumors of a “Rexit” have circulated for months, on Thursday, it suddenly seemed that Secretary of State Rex Tillerson’s ouster might be imminent. On Thursday morning, the New York Times reported that the White House had developed a plan to force the former ExxonMobil chief out of office: CIA director Mike Pompeo would become secretary of State, and Arkansas senator Tom Cotton would take over at Langley. The White House did little to quash the rumor as the day wore on. Tillerson was in the West Wing for meetings, and during an unrelated event, Trump was asked if he still wants him in the position. “He’s here,” Trump replied, “Rex is here,” apparently meaning he was somewhere in the building. Then White House press secretary Sarah Huckabee Sanders said, “There are no personnel announcements at this time,” but did not deny that a transition is in the works. Later in the day, the Washington Post reported that Pompeo has been informally preparing to take over at Foggy Bottom for some time. “Pompeo is quietly looking at staff and figuring out how the department could be reorganized to be effective again,” said a White House official. Tillerson is scheduled to have lunch with Trump and Defense Secretary James Mattis on Friday, then next week he’s off to Brussels, Vienna, and Paris — so the White House is humiliating the secretary right before he goes off to advocate for U.S. policies on the international stage. In a normal scenario, the visit might mean Tillerson’s job is safe for a few more days, but recall that when Trump fired James Comey, the FBI director learned he’d been dismissed from a TV news report while addressing agents in Los Angeles. Trump has pelted Sessions with verbal buckshot on Twitter day after day, assailing him for failing to go after Hillary Clinton aggressively enough; for not purging the acting head of the FBI; for being “very weak.” The insults haven’t been limited to the virtual. Trump has said he was “disappointed” with Sessions at a news conference; he has rolled his eyes when asked whether Sessions should resign, and more. Later we learned that Sessions had actually tendered his resignation back in May, shortly after his recusal from the Russia probe led to the appointment of a special counsel. But our fickle commander-in-chief decided to keep him on in May, and again after his temper flared in July. It doesn’t seem that Trump is 100 percent settled on the plan to replace Tillerson (particularly because opening up Cotton’s Senate seat in 2018 could be dicey), so it’s possible he’ll keep him on for a while longer. However, while Sessions seems to truly love chipping away at civil rights as head of the Justice Department, Tillerson has never appeared passionate about the job. Though he may enjoy the job now, Tillerson let it be known that he had little interest in being secretary of State.